ZENESIS™ patterned technology delivers consistency in diamond exposure, providing maximum efficiency start to finish. With feed rates exceeding 15 ft/min this blade outperforms random diamond bridge saw blades by 30 –70%. Hybrid diamond layering guarantees that diamonds will always be evenly exposed on all sides of the segment. This further increases cutting speed and debris/swarf removal. Diamond clusters provide more diamond point exposure, which increases cutting speed with less amp draw and therefore is easier on machinery. ZENESIS™ products are manufactured utilizing the highest standards of manufacturing in ISO certified facilities. This delivers consistent results blade after blade and batch after batch. 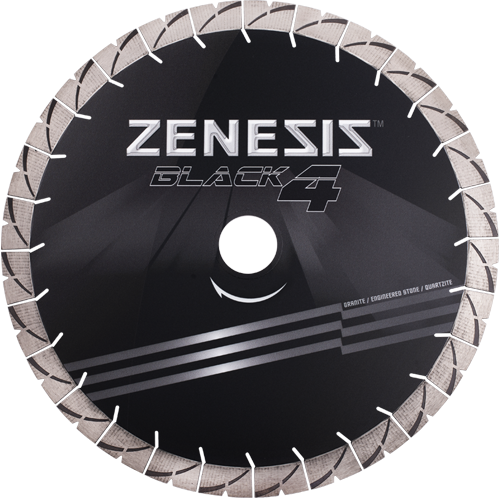 The ZENESIS™ BLACK 4 blade is built on high quality, slanted gullet silent cores. Strong cores keep segments cutting true even when mitering, and the slanted gullets draw in more water and push out more swarf/debris resulting in cleaner cuts. Designed to outperform all other bridge saw blades on straight or mitered cuts.